Most of the books penned by Indian authors belong to the genre of romance. Else, it would be chic-lit kind or it will be based on mythology. And, we readers have also become comfortable reading those kinds of books. 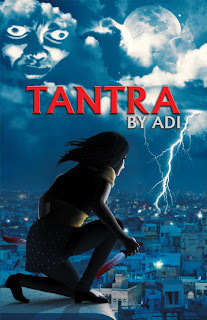 In such a situation, a book like Tantra authored by Adi is freaking different. And the book scores high right there. To begin with, the book cover and design itself is unique. The texture sets the mood for the book right away. As readers, we understand that it is a serious book and thriller. The book scores high again here because the book meets the high expectations set. Anu, the protagonist, comes across as a bold and independent woman. She has a personal agenda which requires her to fly from New York to India. The first few pages move very slowly. Hence, we may sit and wonder what we are reading and where the story is leading us. It may be because the author is giving away too many details... Or it may be because the plot is something very new to us. But, once we get a grip over the story and we become aware the story-premise, we start enjoying the book. Author’s narrative is vivid and we can actually visualize each of the scenes. The book has around 300 pages and suffers slow take off. Yet, the book can be a onetime read. Yes, it can be read once as a token of motivation to the author who has taken up such an unusual idea. To conclude, I enjoyed the book. It is fresh. PS: Let me take this opportunity to thank Blogadda. Their Book review program is highly motivating and I am elated to be a part of their program.